A multitasking pervert is behind bars after Florida cops arrested him for masturbating as he squirted hair conditioner on the “buttocks area” of female shoppers at Target, cops report. 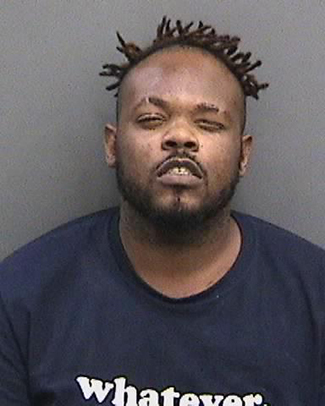 Brian Dijon Boyd, 27, was arrested Sunday afternoon in connection with a series of vile encounters at a Target in Tampa, according to a police report. When confronted by a sheriff’s deputy, the 6’1”, 300-pound Boyd pulled away from the cop and escaped from Target. He was subsequently apprehended and charged with six misdemeanors, including fours counts of battery and indecent exposure. Pictured above, Boyd is being held in the Hillsborough County jail on $6000 bond. Boyd has a lengthy rap sheet that includes collars for marijuana possession; contempt; possession of drug paraphernalia; violating probation; theft; credit card fraud; carrying a concealed weapon; and exposure of sexual organ (for which he was convicted last year).